Do you have a ton of paper staring at you in your office or on your kitchen counter? Most of the time this is a big complaint. Are some of those papers your monthly bills? Many of us have files we’ve labeled “Telephone”, “Utilities”, “Water/Garbage”, “Cell Phone”, “Credit Cars”… Sound familiar? We’ve set up these folders because that’s how our parents used to do it. So when we moved out of their home we did the same thing. Only, we hate to file them. http://wordpress.williamrussell.net/?p=24 buy viagra online reviews Do you really need to keep those bills? Probably not. While what I am going to say may make you feel a bit queasy or uncomfortable, I say it to help you eliminate the paper monster in your life. No, I am not recommending that everyone go paperless, don’t worry. I am recommending, however, that you embrace technology. Create passwords to your utilities, phone, and credit card accounts so you can access your information online at any time. Get comfortable with their websites so you begin to use this valuable resource. You can look up past bills, see recent statements at the touch of a button. If you are reading this blog then you have access to the internet so use it and eliminate the need to keep all those paper bills. It’s okay if you still want to get your paper statement (or you can request that they be sent to your email in box). The point here is that you don’t need to file or keep those bills. After you pay a bill, shred it. The information is still there online anytime you need it. So get comfortable and let go (if you haven’t already) – I double dare ya! It’s important to back up the data and photos you have on your computer. We all have so much data on our home computers today, especially if you have started scanning paperwork. 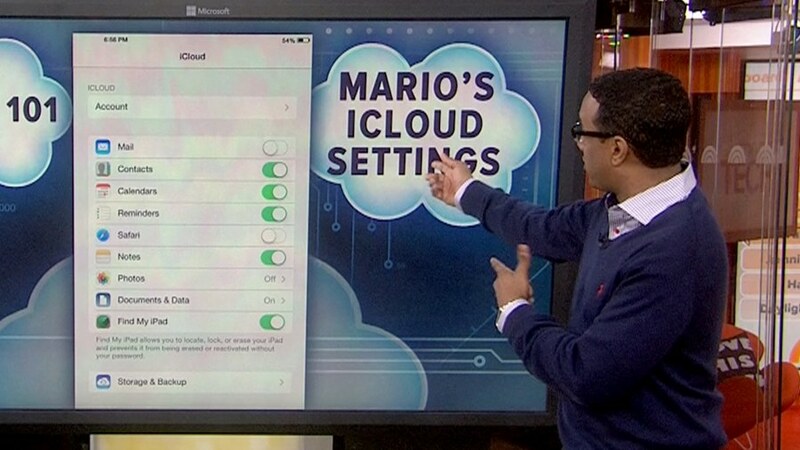 One of the ways to back up your data is in “the cloud”. Many of my clients are not sure what ‘the Cloud’ is and if it’s a secure place to store their data. You can store data off site, on the internet. You can store documents, pictures and other data (not programs). Not everything on your computer needs to be backed up. You can access your data on other equipment – your phone, your tablet and other places that have an internet connection. You won’t get 100% safety on the internet, even on the most secure sites. Encrypt your data and use strong passwords. Having multiple back-ups is a good idea. For example, using an external hard drive in addition to the cloud services. Some of the following links are affiliate links, if you choose to do business with one of these companies, Organized Habits may receive a small referral fee. Having back up is part of maintaining the organization of your photos, paperwork and documents. Create your back up plan and start to implement it today. We all hate to lose our data because there is never a good time to lose data! Do you use other cloud services? I’d love to hear about them. 1. Opt out of paper statements. Review bills online and pay them online. 2. Give gift receipts with your gifts and toss the original receipts. 3. Reduce junk mail by registering with DMAChoice.org. 4. Throw away those small-dollar-amount cash receipts before you even get home. 5. Call the charities you no longer support and request to be removed from their mailing list. 6. Put your magazine subscriptions on a diet. 7. Scan your recipes and get rid of the sheets of paper and recipe cards. 8. Shred your medical explanation of benefit statements after you review them. 9. Throw away those investment prospectus reports if you’ve never read them then request online copies only. 10. Eliminate the other language portions of your product manuals. Receipts seem to really confuse some people. I have seen clients hold onto YEARS of receipts. They are in ziplock™ bags, crammed into junk drawers, stacked and sliding off counter tops, and forced into bulging file folders. They come into the home every day but never leave! Weekly receipts come from the grocery store, doctor visits, medication, clothing purchases, and other such purchases made needed for your home and car maintenance. Big ticket receipts are for large purchases like a washer and dryer, new roof, computers, TV’s… you get the idea. And gift receipts are for – you guessed it – gifts purchased. Do you need to hang on to each and every receipt? The short answer is “no”. The long answer is “it depends”. And that’s where folks get stuck – it depends. Once they are stuck, no decision is made and hence years’ worth of receipts clutter their life. At my Declutter Your Life groups (in Sacramento and Chico, CA), this was a hot topic so I created this flow chart to help with the decision making. Set up an in-box to collect receipts. Have a folder or envelope to save questionable receipts for 6 months; purging on at the beginning of each new month. And for the large purchases, keep the receipts with the product manuals. So take control and start making decisions about those receipts! I want less paper to deal with in my life and I have a scanner. So where should I start? I decided to start with my collection of recipes. So where do I store the recipes electronically? Whatever I store them on has to be able to be taken into the kitchen to use while cooking. What program should I use to capture my recipes? It needed to be easily accessible and easy to use. 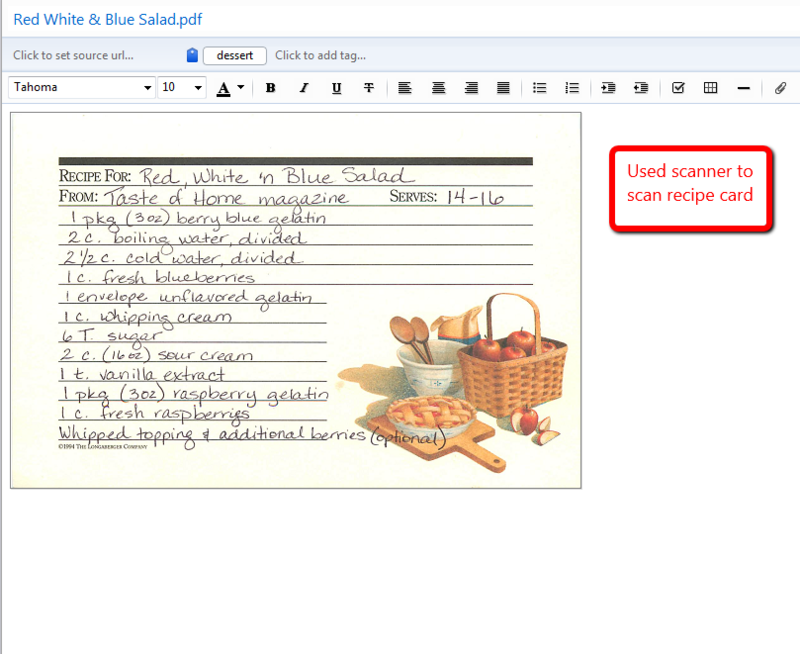 I started by transferring my recipe box and loose paper recipes using my scanner. Read this post if you want to know what kind of scanner I use. I went to my mother-in-laws during Christmas and wanted her yummy cookie recipe, so I took a picture of it. 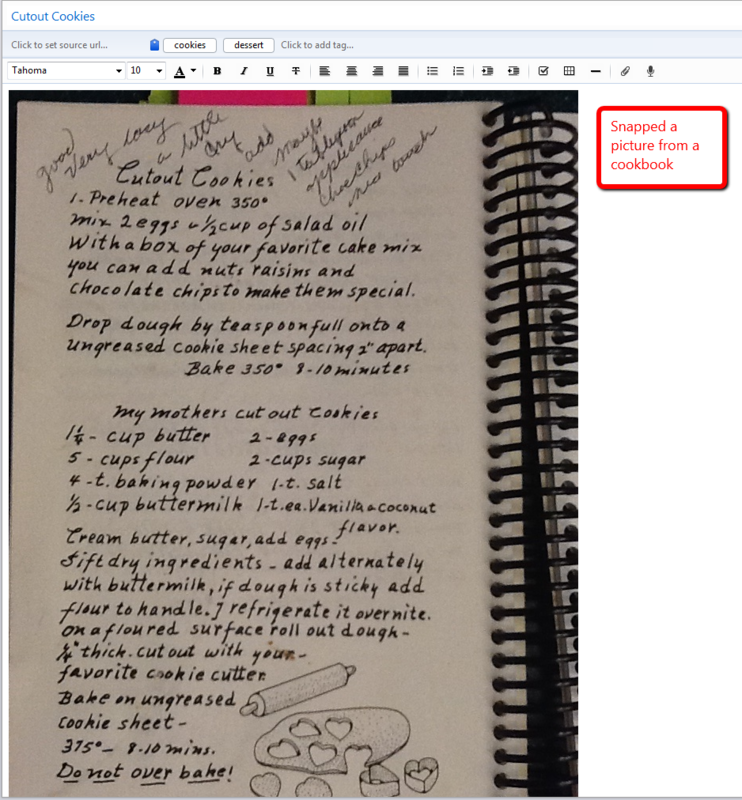 I also just opened up Evernote and typed in a recipe that was very hard to read when scanned. Evernote also allows you to use “Tags”; think of them as keywords. So I added tags to every recipe. That way when I want to make something with the ingredients I have on hand, I just type in the ingredient and all recipes with that ingredient comes up. 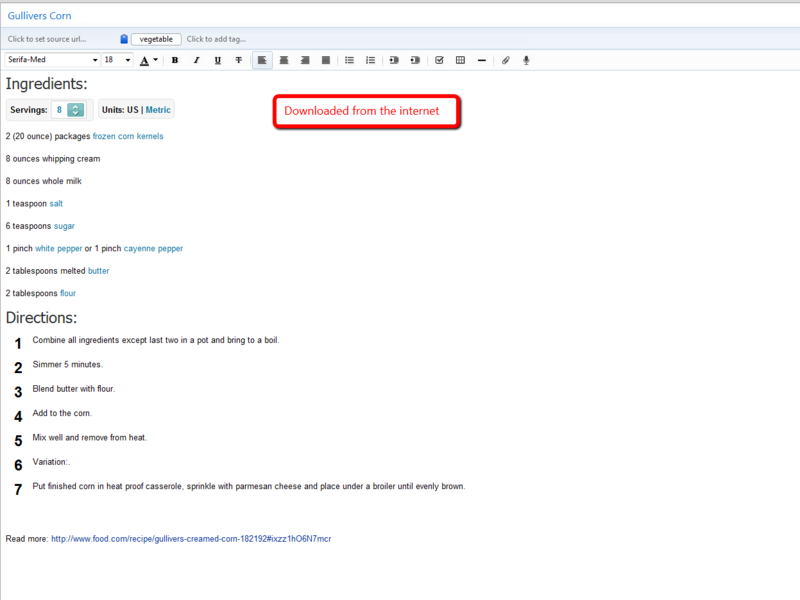 Aside from using the Tags feature, Evernote also has a search function, references the URL from things captured on the internet and allows me to make notes directly to my recipes, regardless of how they were entered in. I can notate for example, that I use canned tomatoes instead of fresh and did not use salt. If someone asks me for a recipe, that’s simple too. I just click on “Share” and I can send it via email, facebook, twitter or using a link! Awesome! 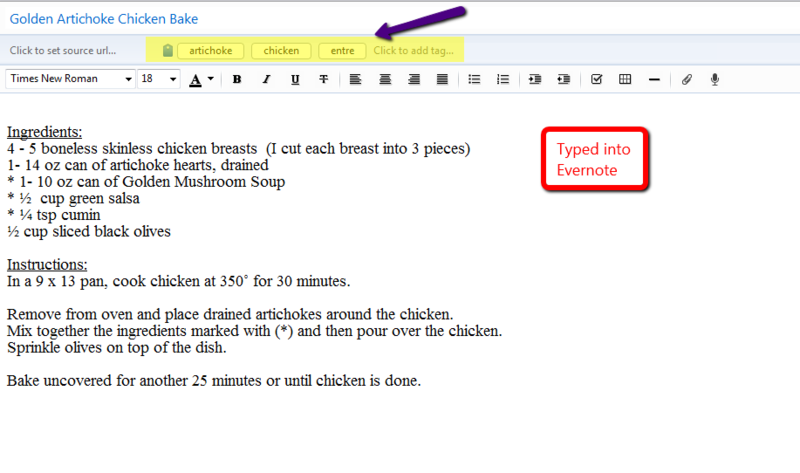 I have over 150 recipes in my Evernote cookbook. I still need to cull through the other cookbooks I have (I only use them for 3-4 recipes) and get those into my Evernote. Then I will pass those cookbooks onto my apartment dwelling, bachelor sons or donate them! Are you going online and finding recipes, then printing them out to make? If so, you may want to check out Evernote and say goodbye to the paper and save your printer ink!